Marion Cotillard in an assymetrical orange Dior Haute Couture dress. Sarah Hyland poses a black Max Azria Atelier gown and Lorraine Schwartz jewelry which she accessorized with a Judith Leiber clutch. Jennifer Garner wears a red Vivienne Westwood dress and David Webb jewelry. Emily Deschanel wears an encrusted Badgley Mischka dress. Julia Louis-Dreyfus looks ageless in a sweetheart gown by Vera Wang and Fred Leighton jewelry. Debra Messing poses in a strapless Donna Karan gown. Emily Blunt looks golden in a Michael Kors gown. Kristen Wiig wears a plunging Michael Kors dress. Golden Globe nominee, Sienna Miller, wears an Erdem ensemble, Giuseppe Zanotti shoes, and Van Cleef & Arpels “Fleurette” earrings. 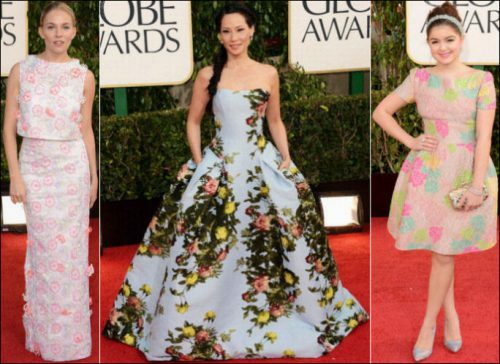 Lucy Liu blooms in a strapless Carolina Herrera gown. Ariel Winter looks cute in a knee-length Valentino dress and a Jimmy Choo clutch. Kate Hudson looks pretty in a belted black and gold Alexander McQueen dress. Naomi Watts wears a long-sleeved Zac Posen dress. Eva Longoria shows off a little leg in side-slit Emilio Pucci gown which she accessorized with Martin Katz jewelry. Jessica Alba wears an Oscar de la Renta gown and a Harry Winston diamond necklace. Amy Adams in a tulle bottom Marchesa gown. Taylor Swift looks like a lady in an eggplant Donna Karan dress. Katharine McPhee looks beautiful in a black Theyskens Theory slitted gown. Jessica Chastain won her Golden Globe in a halter Calvin Klein dress and Harry Winston jewelry. Allison Williams smiles in a J. Mendel gown and Lorraine Schwartz jewelry. Zooey Deschanel is adorable in a sweetheart gown by Oscar de la Renta. New mom Claire Danes wears an Atelier Versace silk gown. Jennifer Lawrence poses in a belted Dior Haute Couture gown. Francesca Eastwood looks old Hollywood glam in Pronovias. Isla Fisher sparkles in a Reem Acra gown and Van Cleef & Arpels bracelets and ring. Amanda Seyfried looks beautiful in a sleeveless Givenchy Couture gown. Nicole Kidman wears a sleeveless Alexander McQueen dress and Fred Leighton jewelry. Julianna Margulies in a beaded short-sleeved Emilio Pucci dress and Fred Leighton jewelry. Rachel Weisz looks girly in a polka-dot Louis Vuitton dress and Jimmy Choo shoes and clutch. Heidi Klum wears a white one-shoulder Alexandre Vauthier Couture dress. Rosie Huntington-Whiteley in a belted black Saint Laurent dress. Halle Berry wears a printed one-shoulder Atelier Versace gown. 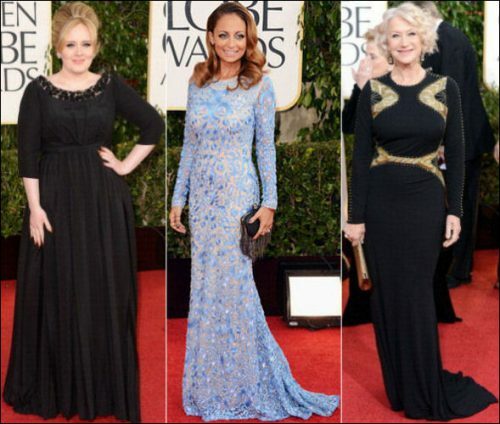 Adele won the Golden Globe in a Burberry dress and Van Cleef & Arpels “Estate” earrings. Nicole Richie wears an embroidered Naeem Khan dress. Helen Mirren smiles in a Badgley Mischka gown. Hayden Panettiere is all smiles in a strapless sweetheart mermaid gown by Roberto Cavalli. Anne Hathaway looks statuesque in Chanel. Lea Michele shows off a little leg in a side-slit Elie Saab gown.